Looking out the window of my kitchen this morning I was astonished to see a few delicate white feathers drifting from above. By the time I pointed out what I’d seen to my husband, they had vanished in a mystery. From where? Were they even feathers? Grey sky above but nothing else to see. No discernible origin. And then a drift of deep grey ones closer to where I stood. I looked up. 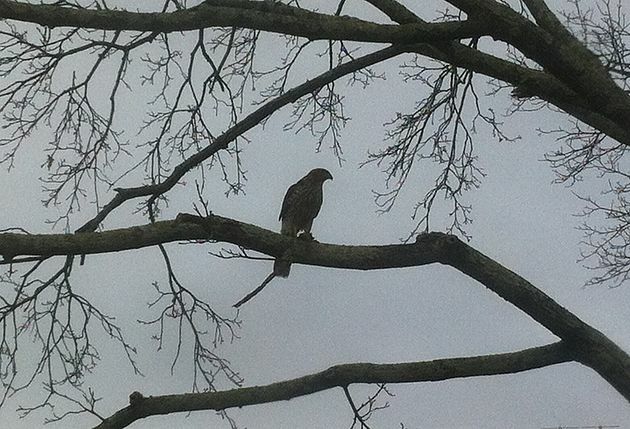 A large hawk was having its midday meal on an upper branch of a massive maple tree in our urban back yard. A race ensued to the third floor for a better view, with shouts to our son, to grab the Peterson’s Field Guide to identify our urban raptor. So we watched as a red-tailed hawk ate its junco meal, each bite interspersed with wary looks all around, as though it could possibly be threatened by predators! The hawk finished its meal, spending several minutes in postprandial satisfaction, rubbing its beak against the perch. We were gearing our cameras towards capturing the moment of inevitable flight when one of our fat local squirrels, fat from eating the sunflower seed meant for birds like the sweet juncos we had observed just a day earlier, appeared on the branch just below. It was now in the immediate visual territory of the hawk above. “That squirrel must have a death wish” our son observed. Just then, red-tailed hawk and squirrel became completely aware of each other, as I cringed and started to look away. In an instant the squirrel leaped to the hawk’s branch in pursuit. Crazy death wish for sure! Stunningly, the hawk hastened to flight and the squirrel settled casually into its space. In the circle of life and death is the unexpected. What do we think we know? Can we know the ending of anything? I think not. It’s a mystery. All the Peterson’s guides or our predictions based on what we know cannot fully inform us. Be in the moment. See what shows up. Life is astonishing.